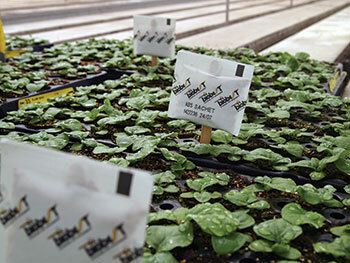 Biobest announced today at the AmericanHort plug and cutting conference the launch of a new product. The company’s ABS (Amblyseius cucumeris) mini-sachet will now be available in a version “on a stake”. The ABS mini-sachet, ideal for protection of individual plants, releases during several weeks the optimal dose of the highly effective thrips predator Amblyseius cucumeris. The traditional ABS mini-sachet comes equipped with a hook that can be easily attached to plant support sticks. Plant propagators showed keen interest but needed an easy solution to apply sachets to plugs or plug trays. With the ABS-mini-sachet on a stake, Biobest now offers a tailor-made product to satisfy the needs of plant propagators in North-America. Also in hanging baskets with ornamental plants, the product has strong potential. The predatory mite Amblyseius cucumeris is a powerful and economical biological control agent for thrips, feeding specifically on young thrips larvae. Thrips is generally the number one problem in plant propagation. Hence, effective biocontrol of thrips is the foundation for successful bio-control in plant propagation. Bio-control solutions for other pests problems are also available. For more information contact Biobest USA (info@biobest-usa.com), Biobest Canada (info@biobest.ca) or Ronald Valentin (rvalentin@biobest-usa.com).